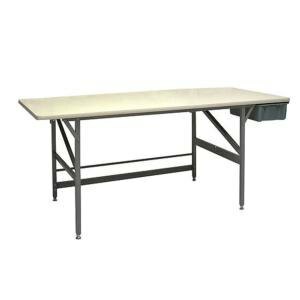 Create a neat, organized, and orderly work area using the Bulman A80-36 standard packing table. The table is height adjustable from 34" to 36", so that you can customize it to fit your individual needs. It features a plastic drawer located just beneath the work top for convenient storage and easy accessibility of utensils and tools. Also, you can add onto your packing table with either the Rotary Shear Cutter or the Razor-X Cutter (sold separately). Made from high quality materials, including tubular steel framing and a composite tabletop, this product is sturdy and durable.